To learn how your business, or the company you work, for could get involved to help homeless animals as a corporate volunteer group, an event sponsor or as partner for various programs, please contact Jossie at [email protected] or call 305-749-1825. Organizations are realizing that if you give employees the opportunity to give back, they may have a renewed appreciation for the importance of their jobs. 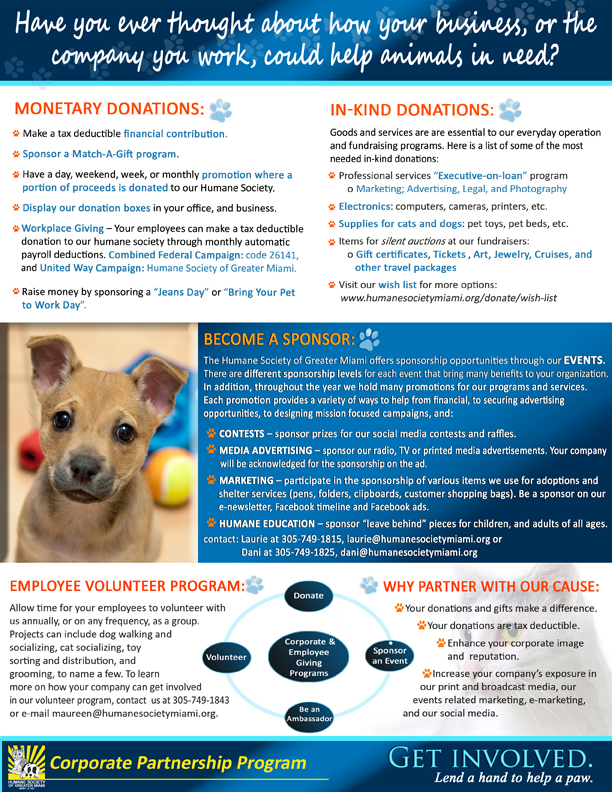 The Corporate Volunteer Program at the Humane Society of Greater Miami allows groups of employees from corporations to work together on current ad hoc projects and/or everyday tasks needed at the shelter. In addition to this being a great help for our organization, studies show that meaningful work through volunteering is linked to improved morale and productivity, which inevitably affects corporate bottom lines. Our volunteer program provides an opportunity for your employees to spend quality time with each other outside the workplace while doing important work for the animals. Organizing a corporate volunteer day at the Humane Society is easy. You will coordinate a mutually convenient day and time period with our Volunteer Coordinator and, together, decide on what your employees will do. Examples of how time can be spent include, but are not limited to, dog walking and socializing, cat socializing, dog bathing, or, feel free to come up with your own task – just let us know what you would like to do!